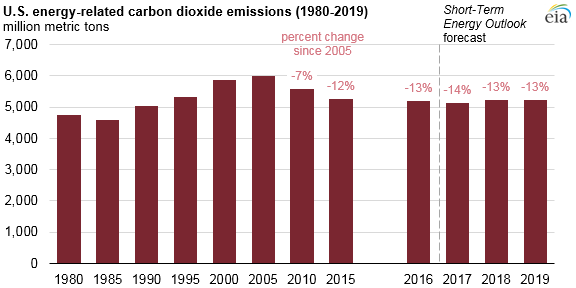 EIA estimates that U.S. energy-related carbon dioxide (CO2) emissions declined by 861 million metric tons (14%) from 2005 to 2017. 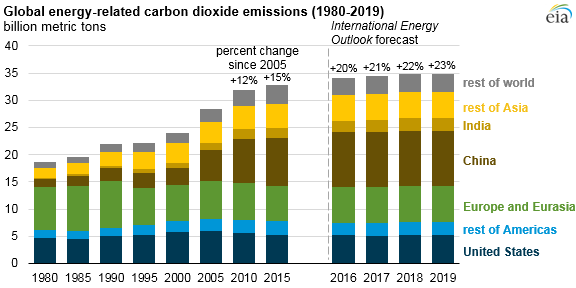 In the latest Short-Term Energy Outlook, EIA projects that CO2 emissions will rise 1.8%, from 5,143 million metric tons in 2017 to 5,237 million metric tons in 2018, then remain virtually unchanged in 2019. In 2019, energy-related CO2 emissions will be about 13% lower than 2005 levels. From 2005 to 2017, coal-related CO2 emissions declined by 835 million metric tons (39%), and petroleum-related CO2 emissions declined by 289 million metric tons (11%). Natural gas emissions, however, increased by 285 million metric tons (24%) over that period. 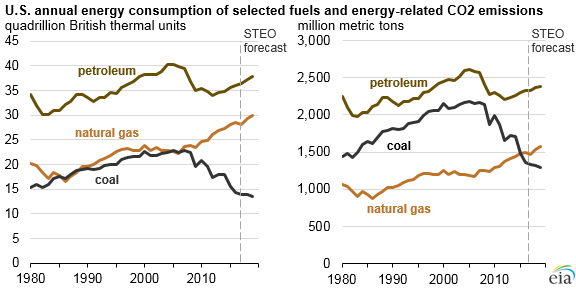 The underlying energy consumption trends that resulted in these changes—mainly because more electricity has been generated from natural gas than from other fossil fuels—have helped to lower the U.S. emissions level since 2005 because natural gas is a less carbon-intensive fuel than either coal or petroleum. EIA estimates that global energy-related CO2 emissions rose by 6,040 million metric tons (21%) between 2005 and 2017 at an annual rate of 1.6%. In EIA’s latest International Energy Outlook, this rate of growth is projected to slow to 1% in 2018 and then to remain essentially flat in 2019. Growth in global energy-related CO2 emissions from 2005 to 2017 was led by China, India, and other countries in Asia, which collectively increased by 6,260 million metric tons, while emissions in the rest of the world collectively decreased by 220 million metric tons. Energy-related CO2 emissions in most regions are projected to stay relatively flat through 2019 with slight growth in India, the United States, and China. Global coal emissions grew the most of any fuel over the 2005–2017 period at 2.1% annually. Natural gas-related emissions grew by 2.0% annually, and petroleum-related emissions grew the least, at 1.1% annually. Coal-related CO2 emissions are expected to increase by 0.6% in 2018 and 2019. Petroleum-related CO2 emissions are projected to grow by 1.6% in 2018 but decline by 0.2% in 2019. Natural gas-related CO2 emissions are projected to increase by 0.6% in 2018 and remain flat in 2019.